With vast undulating grassland savannah and dense dry forest, Garamba is one of the oldest and most well-known national parks in Africa and home to the only notable elephant and giraffe populations in the region. Only a few Kordofan giraffe remain. The southern part of the park is predominantly grassland savannah with scattered trees. Further north the vegetation is mainly mixed woodland, with dense, dry forests and riverine and small swamp forests. In contrast, the hunting areas are predominantly dense bush savannah, mixed deciduous woodland and forests. With abundant food and water resources, Garamba provides excellent habitat for elephant, hippo, buffalo and Uganda kob, while less common species such as giraffe and roan antelope, although rare, can also be found. The species that roam Garamba are notably spotted hyaena, leopard, lion, serval amongst several others. These include the Guereza colobus, Patas monkey, vervet monkey, the De Brazza’s monkey and the chimpanzee. Ugandan kob remain in Garamba and its surrounding areas. Hippopotamus and Nile buffalo are the two most prolific species in Garamba. Other species found in the park includes a variety of hogs, such as the red river hog and warthog. Many large antelope species remain in Garamba and its surrounding hunting areas, including bushbuck, waterbuck, Ugandan kob, Lelwel’s hartebeest, roan antelope and bongo. Several species of duiker, notably blue duiker, red-flanked duiker and yellow-backed duiker, occur in Garamba, as well as oribi. Spectacular colonies of carmine bee-eaters. Bird diversity is high with more than 340 species recorded. Spectacular colonies of carmine bee-eaters are common along the banks of the River Dungu and clouds of cattle egret can be seen circling over the large herds of buffalo. Garamba’s elephant are being poached at an alarming rate and the park is experiencing a negative population growth. In addition, the Kordofan giraffe is critically endangered, with only 47 remaining in the DRC. For a long time, research and monitoring in Garamba concentrated mainly on the population dynamics of the northern white rhino and, to a lesser extent, elephant and giraffe. However, these operations were halted in February 2005 when expatriate staff from a previous project left the park. As a result, what was known about the wildlife populations became increasingly outdated. Since then, Garamba has embarked on several monitoring programmes, fitting tracking devices to giraffe and elephant to learn more about their movements. In May 2017 we successfully collared 39 elephants, one of the largest elephant collaring exercises done to date, fulfilling an important objective in the monitoring and conservation programme of key species. These additional individuals bring the total of collared elephants in the park to 54, which are being effectively tracked. 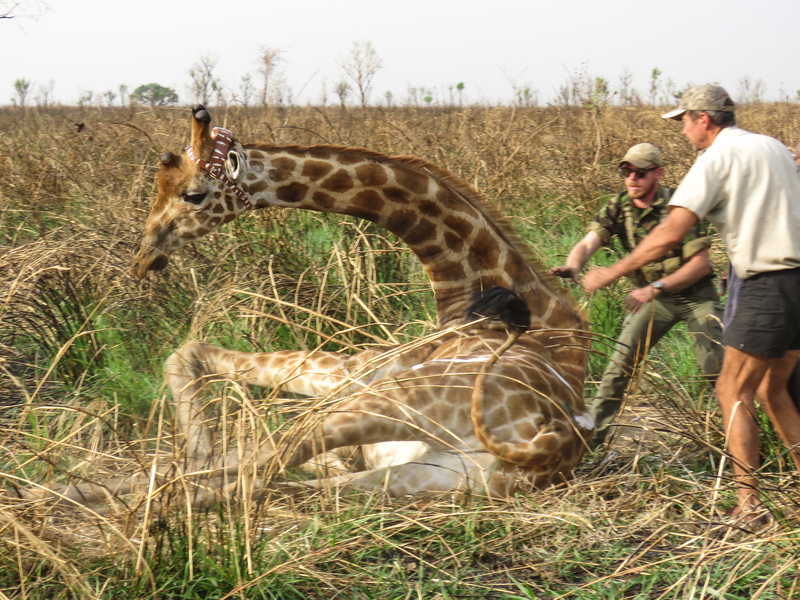 Garamba is home to the only remaining Kordofan giraffe population in the DRC, however their numbers have plummeted due to poaching, but also other causes such as high levels of predation and forage limitation. To gather more information on these critically endangered Kordofan giraffe and follow their movements, they have been fitted with satellite tracking harnesses. These 47 giraffe are the last remaining Kordofan Giraffe in the DRC; and seven new calves have been confirmed in the last year.